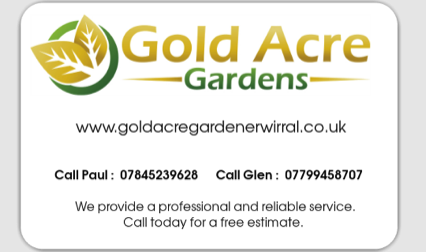 Our experience working with businesses in the Wirral has allowed us to cater for a number of different styles of gardening. We offer a versatile service to best suit your needs. Whether you need your business grounds to stand out and look attractive, or simply keep the weeds in check, we are able to help. This usually includes businesses with busy trade: shops; dentistries; restaurants etc. We understand the importance of image - this is why we make it our priority to give your customers the best impression of your grounds. A professional service is what we aim to provide. Timing is essential. Upon meeting, we will discuss a preferable time slot for your business. You don't want us there when things are busy. Weekly targets are also welcome. Feel free to to keep us up to date. We put a lot of effort into communication, so any requests will be dealt with promptly. If you own flats, housing complexes or are a landlord with a number of properties, then don't hesitate to call. We have the means to create the results you desire. We understand that it's hard to keep tenants happy. However, with our experience and work rate, that wouldn't be a problem. We have the best equipment in order to work efficiently at every task. Also, our friendly staff are always happy to help with any requests that may be be made by yourselves or tenants. All keys being locked away each night. No information regarding address etc. is stored with its corresponding key. No images of property will be taken. Consent must be obtained first. Fence panels and locks (for garden gates) will be fixed ASAP. Any sensitive information stored on computer will be located in a locked file. If there are any further measures you feel are necessary, please feel free to tell us. We want to provide the best service we can. Commitment to a job will secure a discounted price. This allows you to stop our work at any time with no pressure to get things going again. Being able to stop us during poor weather conditions does save money. However, with this option, all extra jobs are treated separately. You would have to let us know if you wanted extra services and we would provide a quote. This option provides you with tighter control of your budget. If there is a lot of upkeep with your grounds then a contract would be advised. This essentially saves you money in the long run. Frequency of payment can range from weekly to quarterly. Whichever method works for you would be welcome. Don't let snow close your business. We can be on call for early mornings throughout the winter to clear the way for your customers/tenants. We will be there before you open to shovel a clear path and apply rock salt to keep the snow and ice at bay. We hope you choose our services. To gain your free quote and discuss any ideas you may have, simply contact us. Lastly, you can rely on all of our staff to be punctual and to act in an appropriate and friendly manner. We want to help build a positive atmosphere for your business.